If you are lucky enough to own an old rocking horse, who is about to go back into active service, you will want him to look his best and it is certainly important for child safety that he should be given a proper restoration. Perhaps there is a grandchild or other new rider on the scene, so it is obviously important that the horse be thoroughly repaired and renovated. At Nottingham Rocking Horses, the Nottinghamshire rocking horses restorer specialises in rocking horse repair and refurbishment. 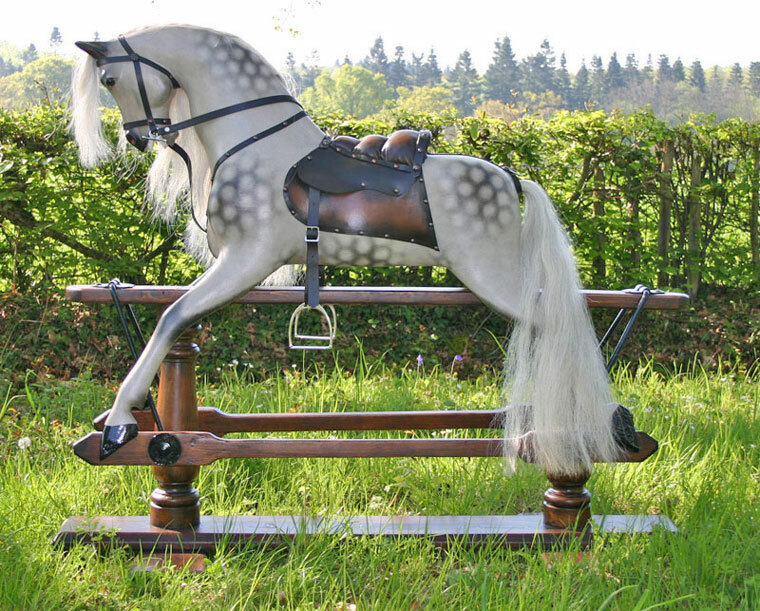 Your favourite antique or contemporary rocking horse can be completely renovated and the structural repair will be complemented by a sympathetic cosmetic renovation which will feaure an appropriate repaint, replacement leather tack and a new horsehair mane and tail. Nottingham Rocking Horses has an area of operation which centres on the East Midlands area of Nottinghamshire, Derbyshire, The Peak District, Leicestershire and Lincolnshire, but also extends into other areas of the Midlands. West Midlands: We restore horses from Warwickshire, Worcestershire, Shropshire, Birmingham, The Black Country etc. South Midlands: We restore horses from Northamptonshire, Oxfordshire, Buxkinghamshire. We are a Cotswold rocking horse restorer. Yorkshire and the North of England: We do not cover Yorkshire but can recommend Yorkshire restorers, JFD Rocking Horses, for Yorkshire rocking horse restoration. We renovate and refurbish most makes of antique and modern rocking horse. Liverpool rocking horse makers, Collinson rocking horses and Baby Carriages, and London rocking horse makers, Ayres, Lines, and Smith are often renovated in our workshops. Wooden and fibreglass rocking horses such as Haddon can be repaired, as can fur fabric Pegasus rocking horses of Crewe. If you would like an estimate for repair and restoration work, please contact us and we will be pleased to oblige. The Oxfordshire rocking horse restorer carries out London rocking horse renovation and reburbishment in London and the South-East to provide London rocking horse repairs and Berkshire rocking horse restoration. The Bedfordshire rocking horse restorer also covers restoration in Hertfordshire, Bucks, Bedfordshire.